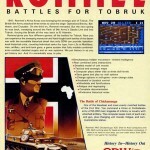 Rommel: Battles for Tobruk by Games Designers’ Workshop (GDW) was planned to be a war strategy game, based around four battles fought between the WWII German commander Rommel and the British in North Africa. Our evidence for the Commodore 64 version of the game comes from a full-page advert by the games designers, who give a detailed description of the game and the combat system used, detailing features such as hidden movement, tactical and strategic maps and details of your armies morale. Nothing else is known about the C64 conversion though – and surprising considering that the Atari version did well on its release. Was the C64 version ever even started? More digging required for this entry, and we hope to track down some of the original developers at some point in the future. Thank you for your feedback Rola – the entry has been fixed as suggested. There will no doubt still be a few entries throughout which have been neglected regarding cross-platform research, but these likely will be older write-ups or ones which were just done quickly for a big update. Not really an excuse I know – we could have checked the scans, but we are human and gradually we’re fixing those we slipped up on as we find them or people notify us. Generally we try to be as meticulous as possible in the limited time we have to keep the site going. In the occasions that we do slip up, we invite people to let us know and we’ll happily update and make the relevant fixes – adding credits in the process for any contributions made. In time we’ll keep re-scanning over the 1000 odd entries we have to re-factor any information or inaccuracies. We’ve done a large amount since the upgrade (including some early immature write ups being re-done from scratch) with still plenty more to go. However, our primary aim is to actually find the disks with the games on. I suggest fixing your comments regarding Rommel and Chickamauga.